Best Gift is our new bar table. It offers oodles of uses, perfecting for a handy place to prop drinks or snacks, or enjoy your breakfast and morning coffee at it. The sleek design gives you the flexibility to move around easily. 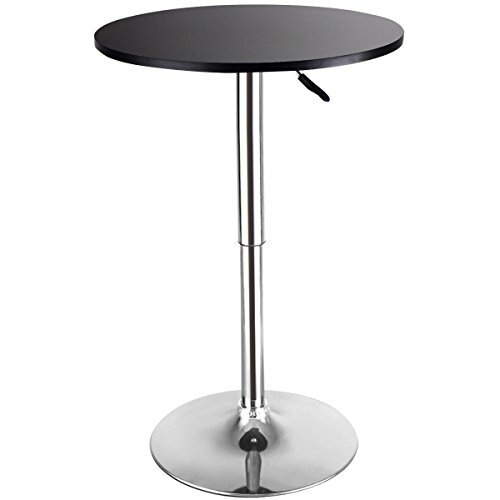 Convenient gas-lift mechanism under the round table top makes it easy to adjust the table from counter to bar height. The base is made from durable chromed steel, high stability and longevity. Don't hesitate to buy it home! 【Modern Style】This bar table combines classic and modern style, so it is perfect for your restaurant, bistro, coffee house, patio, home kitchen or any other decor theme. 【Height Adjustable】The side pneumatic handle adjusts the height from 28'' to 36" easily and safely. 【Swivel Design】The 360 degree swivel design of table top provides space and convenience for everybody. 【Non-Marking】The bar table stands on a sturdy circular chrome steel base, which has a 18" rubber ring to prevent your floor from scratching. 【Easy Handling】This high quality bar table is made of MDF and chrome steel, and it is easy to clean with damp cloth. View More In Bar Tables.